Building a sauna yourself is a an excellent method to take for those experienced in basic construction and looking to save money on hefty installation costs and manufacturer pre-cut labor. Not only is it a reward process, but with the help of our professional guidelines you will learn how to effectively build a beautiful sauna with relative ease. 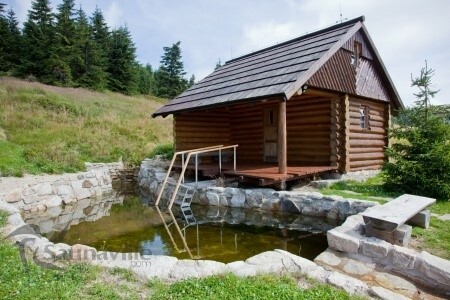 All too often homeowners shy away from building a sauna out of fear of not having professional construction experience. This is not necessary. The truth is, you do not have to be an expert to build a sauna – leave that to us! With the help of our professional, fool-proof guidelines and a can-do attitude, you’ll be able to build your own sauna and experience the rewards and benefits of these luxurious amenities. Now that you’ve properly planned your sauna and purchased the material, it’s time to put the plan in action and begin building your unit. Building a sauna doesn’t require a lot of time. Once you have the correct material, we recommend that you dedicate 24 – 36 hours of your time to spend on the building and installation process. Once the plans are set, it’s time to begin installing your sauna. First, measure the dimensions for the wall base plate and mark the measurements accordingly with snap chalk lines. Next, lay out the triangular base plate using 2×4 pressure treated wood. It is crucial to use pressure treated wood to prevent moisture issues. Cut two additional 2×4 top plates to match the dimensions of the bottom plate, and overlap the joints at the top plate. Mark wall stud points for both top and bottom plates, and cut the appropriate number of studs to the height of your sauna. Once you’ve accomplished this, lay out the pieces in their proper location and fasten the studs and plates together using 10d galvanized nails or a pneumatic nail gun. Now it’s time to insulate. Before you begin this process, it might be wise to lay out temporary polyurethane sheeting over the insulation to keep yourself comfortable while working with the insulation. After you’ve completed this step, you may proceed and install the insulation in the walls behind the sauna. Administer construction adhesive to the bottom of the base plate, and drive concrete nails with a sledgehammer to fasten the framing lumber to the concrete. Stand wall number one in place, ensuring that it’s properly leveled, and use 3” drywall screws to attach the end stud to the nailer. Lastly, in order to secure the wall sections together, nail the second top plate to the top of the wall. It’s important to be mindful of the dimensions for the sauna door while you’re fastening the three walls together. 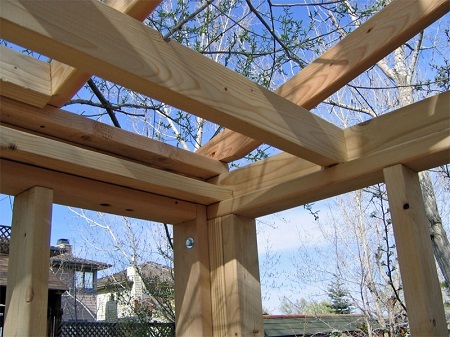 Note: Adding 2×4 blocking between the studs will ultimately strengthen the frame and ensure top quality construction. To accomplish this, attach a 2×4 ledger board across the back of the interior sauna wall in order to properly support the ends of the ceiling joists. Next, lay out the ceiling joists across the top, making sure to provide a six inch overhang on both sides. For the front, use a ten inch overhang. Cut off the ends of the rafters to create a front underside over the doorway. Be sure to measure the shortest rafter to determine the proper length of the overhang. Lastly, install 2×4 fascia framing with 16d nails. To complete the enclosure, frame the windows (if applicable) and run the wiring for the sauna heater and interior lighting. Most sauna heaters draw power from 220 volt sources. If your sauna uses this voltage, it will need to be properly inspected before you begin using it. The foil vapor barrier is an essential component to sauna installation due to its heat reflecting effect, which prevents the risk of fire. 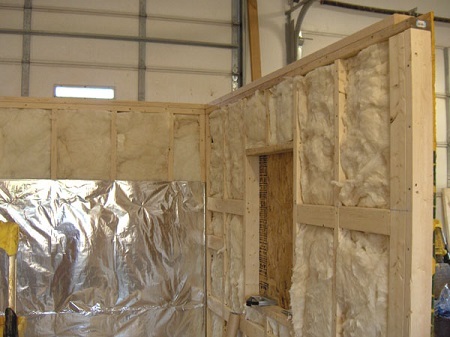 To install the foil vapor barrier, staple the foil to the wall studs (starting from the bottom). Next, overlap the seams 5 inches and extend the vapor barrier over the ceiling joists, making sure to completely cover the interior. First, start by installing the sauna ceiling boards. To do this, simply hold the edge of the board against the wall and nail it into the ceiling joists. Repeat with each ceiling board, utilizing the board grooves to secure the pieces together. The wall boards are installed in the same manner as the ceiling boards. Continue installing the boards until the interior walls are complete. Before installing the outside covering, fill any gaps with fiberglass insulation to ensure that your sauna holds internal heat. Use the same method above to install the exterior covering. Use a jigsaw to cut out the area for light switches. 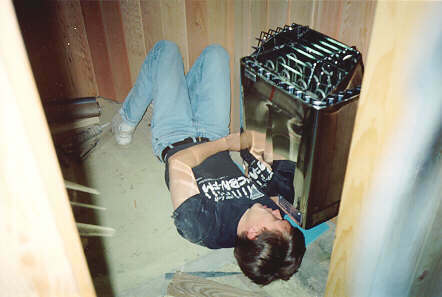 To install the sauna heater, use a drill to screw the heater support brackets to the wall at the required height (please check with the manufacturer as every heater is different). You can now place the heater within the brackets. Lastly, attach the heater guards. There are a lot of different sauna heater variations. First, start with the benches. To install the benches, measure from the floor and mark a level line on the walls and secure the top of the bench supports with this line. Using 3″ screws, secure the support brackets to the wall, making sure they’re level. Place both upper and lower benches on the support brackets, then install a bracket to support each end of the bench. Next, rest the bench on the cross bar and attach it with lag screws from below. Use the pneumatic nailer to install the corner moldings. Be sure to cut the molding about ¼” longer than the required measurement, then place each end in position and snap the molding into place. To install the windows, start by placing them into the wall openings. Use shims and a level to set them, then secure the windows with screws through the jamb and into the wall framing. Flooring options vary for each sauna. Some people choose wooden floors to compliment the ambience of their sauna, while others prefer tile. Be sure to talk to the manufacturer to decide on the most suitable option for you. After you’ve installed the flooring, you can now enjoy your new sauna. 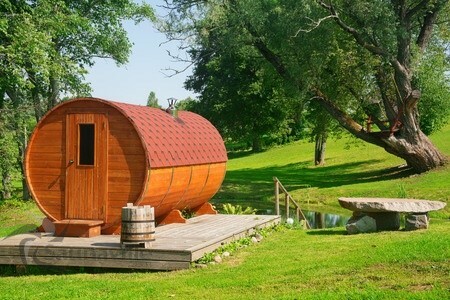 After your work is done you can kick back and relax in your beautiful new sauna!